The four “R’s” of writing. Well, five if you count “rejection,” but let’s not go there today. Instead, we’ll focus only on the creative process. Love to write but don’t have ideas? Don’t have time to write? Get stuck at key points in your manuscript? Now that you’ve revised your story to the best of your ability, let it rest. This is always hardest for me – I’m usually so eager to send my story out into the world, convinced it’s as good as it can get. Whether this impulse is out of confidence or impatience, it’s almost always a bad idea. Set it aside, work on something else, send it to a trusted reader. But avoid the temptation to keep tinkering. Come to it with fresh eyes. Your story will thank you. After you’ve taken a break and are ready to sink your teeth back into your story, you will be better able to objectively evaluate it. Maybe you’ll need to rewrite some sections or start over entirely. Maybe you need to revise some story aspects or revert to older versions. Make the changes. And then (and this is important) let it rest again. 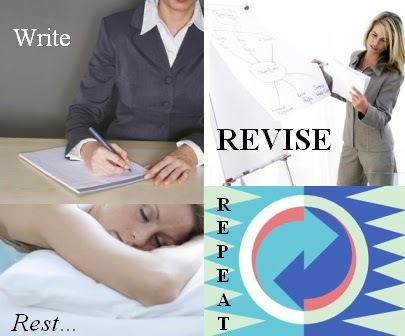 Happy Writing (or Revising, or Resting, or Repeating…)! Great post 😀 I struggle with the Rest part as well. I'm incapable of stepping away from my manuscript, but I'm that way with everything. When I start something, I am compelled to keep going until I finish. It's kind of annoying really lol. Super awesome links, Blue! I'll definitely be checking out a bunch of these. I'm tweeting this post! This blog is just an incredibly rich resource. I hardly know where to begin. I haven't read through all your links yet, but I would add: a hint that your ms may not be ready is when you get a high proportion of (rejections) on your queries. This is why I personally favor a middle way when querying: send out a handful. wait for responses. revise query and ms. send out more queries. Quite a bit like the writing cycle you describe above.